Ice Climbing is a very challenging, but quite popular sport at Zermatt. 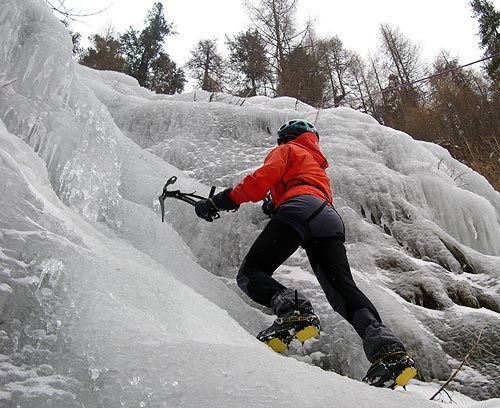 Over the ice of frozen waterfalls, one reaches a place which is only accessible by ice climbing. Climbers have to fight a fear of heights and have excellent physical fitness the payoff is well worth it. You might have often caught sight of mountaineers and adventure aficionados making their way through the rugged icy cliffs and left wondering what triggers these individuals to brave the perils that such heights of snow-encapsulated peaks reverberate with. The truth is, this is the very challenge of braving the danger of falling into an icy crevasse or overcoming the gigantic avalanche that makes ice climbing so thrilling to its enthusiasts. Having its origins back in 1908 when Oscar Eckenstein a zealous mountain climber invented crampons or toothed claws that get clasped to the boots and enable climbers to have support on the slippery surface, ice climbing has since then risen in popularity enthusing the spirit of taking challenges in many who love to dare. The sport comes with a whole cauldron of difficulties that climbers require facing. Avalanches may fall and injure them, large chunks of ice may get detached from the rocky surfaces and impact with climbers, or even cause loose hair to freeze. However, despite these perils ice climbing has come up as a sport because of the innovation of a repertoire of gear for easy access to the icy cliffs and training offered by expert ice climbers. In fact, having a guide at your disposal makes ice climbing a thrilling sport for any winter sport enthusiasts including those who have not yet ventured into this arena of rock climbing. You can make your way through those sub-zero weather conditions going up steep cliffs or you may choose to get comfortable through recreational ice climbing in less difficult terrains on a sunny day. 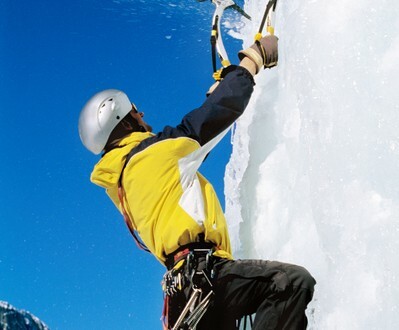 But you do need to gather the right gear for ice climbing, which include: crampons, ice screws for prevention of falls and of course a helmet to shield your head. Your guide will advise you on taking belays whereby one or more individuals are involved in helping each other while climbing with the use of ropes which may either be fixed or running depending on the number of climbers participating. Your guide will instruct you about all probable accidents and how to stave off from them by learning to maneuver your gears right and being focused on your climbing spree. Once you have grasped all the nuances and have an expert to guide you across, you can be sure of experiencing the real thrill of challenging the steep icy terrains with all your might and determination. At the Gorner gorge, they offer a very special experience every couple of years. When the river and the rock walls glisten with clear ice coating, daring climbers can descend into the gorge and transit it. It is only recommended in the company of a mountain guide but it is absolutely exciting and thrilling. Depending on how cold the weather is in winter, completely new areas in the Zermatt mountains can be discovered such as Furi or on the Findelbach. So grab your gear or rent them at many sports shops around Zermatt and have a thrilling time climbing the pure and clear ice walls of Zermatt.